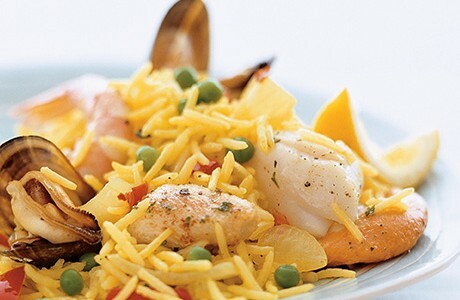 This version of classic seafood paella mixes meaty tiger prawns, scallops and chicken. The rice is cooked in fish stock giving it a distinctive taste as well as making it light and fluffy. Rinse the rice a few times until the water runs more or less clear. Place the fish stock in a large saucepan, bring to the boil and add the bay leaves, turmeric and mixed herbs. Add the rice, cover, and cook over a very low heat for 16 minutes, stirring occasionally. Add the frozen peas and cook for a further 4 minutes, until the stock is absorbed and the rice is cooked. Remove the bay leaves. Meanwhile, heat the oil in a paella pan or large non-stick frying pan over a medium heat. Add the onion, garlic and chilli flakes and stir-fry for 2-3 minutes. Add the red pepper and stir-fry for 4-5 minutes, then add the chicken and stir fry for another 5-6 minutes. Stir in the prawns (and mussels and scallops if using) and heat through gently for 4-5 minutes. Ensure the scallops are thoroughly cooked but be careful not to overcook them. Add the seafood mixture to the rice and stir gently to combine. Add the lemon juice and serve immediately.